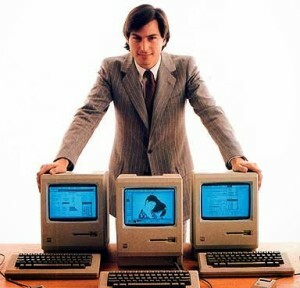 and I’m not talking about the Macintosh. In the news at the moment there’s been a number of stories about the launch 30 years ago of the Apple Macintosh with its flash media event and slick marketing “Big Brother” advert. However, two weeks previously in a lower key event a 3rd of the planet away in a London hotel there was another event, another launch of another computer which is rather less well known but was a breakthrough in many ways and the stepping stone to other, greater things. The inside of the original flyer advertisement distributed inside magazines in January 1984. Now the Sinclair QL was in many ways a flawed design, mostly due to some really silly design decisions such as using the 4 bit Intel co-processor to do keyboard input, sound output and serial port input. This poor, underpowered chip could just about do one of those jobs at a time but not two, which meant that if you played a sound you couldn’t read the keyboard properly and you certainly couldn’t accept any data on either of the serial ports. However, this ignores what it did provide. It was the first “affordable” 16 bit computer system with a fully pre-emptive multitasking, modular operating system. It may have been aimed at the business consumer, a boat long sailed by this point, but it found a niche in the programming community. A Mac Plus I rescued. Now, you may be screaming by this point, “But the Macintosh was far more influential and it’s still here!” Well, I’d agree that the Mac did bring a huge leap forward in usability and design, for a price. However, the machines which are sold as Macs now have very little to do with that cream box with a handle and a screen launched all that time ago. MacOS now is not a descendant of that original Mac operating system at all, it’s a direct descendant of NeXTstep, the BSD UNIX derived OS running on the NeXT Cube, from Steve Jobs’ other company. Even Postscript and the other innovations didn’t come along with the first release of MacOS, they happened later when the Laserwriter was created. 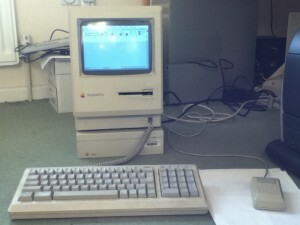 It should also be remembered that the Macintosh was not the first computer marketed which had a WIMP environment and a mouse, there was the Apple Lisa before it. In many ways the Macintosh was the Lisa-Lite and most of the launch applications were quick ports of the Lisa applications. 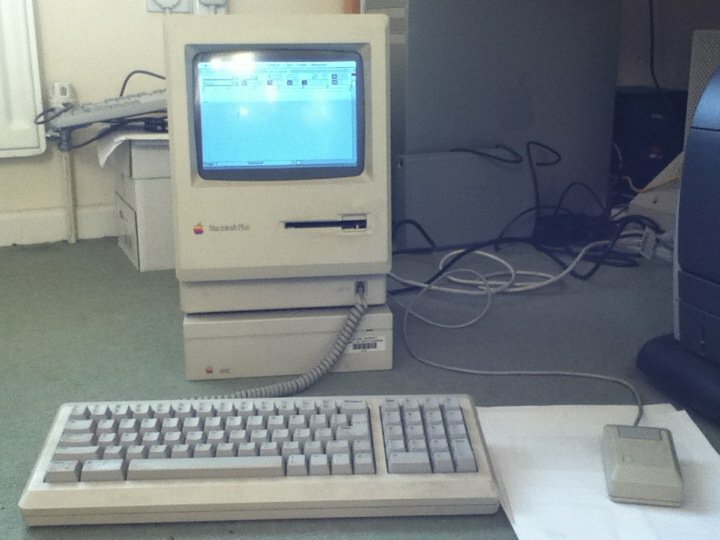 On the matter of cost, when the Macintosh was released it may have been affordable to a few in the USA but it was well beyond anything the normal person in the UK could afford. If you could find an Apple dealer the price of a Macintosh started at around £1300 and went up steeply if you wanted to actually do anything. This is why they were so rare. The first one I saw was in 1988 in the Pi Magazine office, University College London. 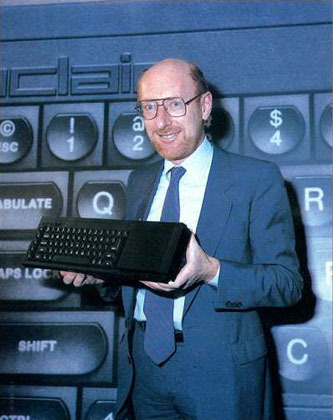 On the other hand, the Sinclair QL was launched at £399. This was still a huge outlay, being half to two thirds the monthly wage of a normal person, but at least you could use your TV as a display, it came with applications and, if you had a printer, could usually be cheaply hooked up to it. Sure, you could spend a whole lot more on a monitor and a printer but you didn’t need to. Now, in many ways the QL was a bit of a flop, especially if you look at it relative to the ZX Spectrum. However, those machines which did go out there had a remarkably high impact in the longer term, even if it wasn’t at all visible. 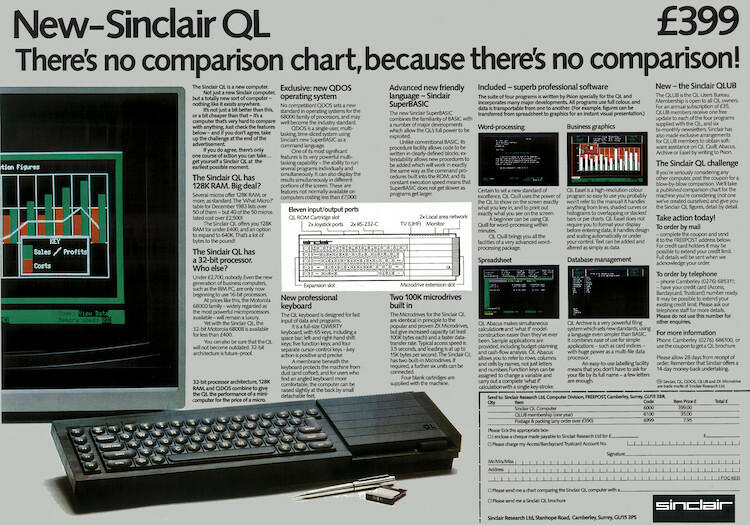 Without the QL would there have been Linux? Linus Torvalds cut his teeth on one, got a little frustrated by the restriction and decided to write his own operating system. QDOS, for all its advanced features and modularity is no UNIX and it was written in a hurry, I can see how Linus may have seen the problems, but it was, in the end his muse and impetus. The QL was also the development platform for the first version of AmigaDOS. Without the QL the Commodore Amiga would have been a very different machine to use. Metacomco in Bristol was contracted to build an operating system for the fledgling machine and because they had been early to support the QL, building compilers for it, they had the M68000 expertise and the tools for the job. AmigaDOS itself was a re-implementation of Tripos, an operating system developed in Cambridge, UK. and written in BCPL. Seeing as Metacomco already had their own BCPL compiler for the QL it was a perfect match. Later versions of the OS were re-written (mostly because Metacomco weren’t actually THAT good coders all told). Anyway, I’d like to wish a very happy birthday to both the Sinclair QL and the Apple Macintosh. You both advanced computing in your own little ways. Both still have active communities (though the QL’s is “somewhat” smaller). May your legacy go on another 30 years. 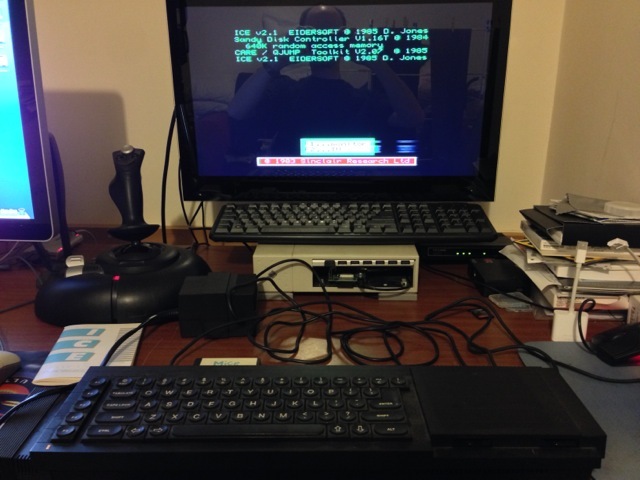 The Sinclair QL I’m currently starting to prepare for an exhibition. I’m currently preparing one of my two QLs (the one I rescued from being recycled by the Oxford University Physical Chemistry department) as a hands-on display in an exhibition at the Oxford Museum of the History of Science which will be happening later this year. By the way, if you have a QL in need of a few spare parts, take a look at “Sell My Retro”.